But just in case anyone is disappointed, here is a spider. Screaming optional. Having enjoyed making my last 12 x 12 landscape so much, I have decided to start another. This is as far as I have got. Can you tell what it is yet? To make it easier, here are the colours I have got ready. I have to make sure I do the sewing in the daylight because under the electric light all the subtleties of the colours are lost. So as you can see, I'm not one for practising my FMQ every day, and I am looking forward to seeing what everyone else has been doing this week. Rather more than me, probably. Firstly, many thanks to Zenia, Hilary, Gwyned, Cynthia, Connie and Rita for linking up last time - a great collection of projects. Linking up to Barbara's blog Cat Patches for the October NewFO. Progress on September's NewFO can be seen here - a few pretty leaves. Having finished the stems on the central panel of the big quilt that I am making, I have started work on the leaves. I am using up small scraps left over from old projects, many of them not wide enough to make an entire leaf, so I am making the most of the colours and using different shades for each side. ... then it is time to do the blanket stitch edging by hand, trimming away the excess as I go. Yes, I know the tension in the machine stitching on the last photo is rubbish. I have adjusted it since applying that leaf. It doesn't matter too much anyway - that stitching is taking no real strain, and it is covered and reinforced by the blanket stitch. The castle at Loarre in Aragon. When we arrived there the castle was enveloped in cloud. By the time we had climbed to the top the clouds had cleared. A moment of mad self indulgence came over me when we were in the market hall in Krakow this summer. One of the stalls had a mesmerising selection of sewing boxes. Because I already have sewing boxes with a light stain I went straight for the high gloss dark varnish. Then I had to examine the lids and decide which design I liked best. These flowers and leaves seem to rotate, and they are outlined with an embedded metal inlay. The curved sides to the compartments and the cream stripes are all so gloriously unnecessary. There is nothing quite like decoration for its own sake - reminiscent of many of the buildings nearby. The box is now filled with all my stranded cotton embroidery threads. With a bit of luck keeping them in separate compartments will prevent them ending up in one great almighty tangle. They can become five smaller tangles instead. No, not me. The tea cosy and mat have gone to Germany. We have had a friend staying with us who now lives in Germany, and he wanted to take home a present for his friend Birgit. She enjoys tea, so a matching cosy and mat in bright pink English tweed seemed like the ideal present for her. She does felt making and is a dab hand at making slippers and hats, so all this colourful woolliness should be just up her street. The tea cosy was finished some time ago and has already appeared in pictures. This time the light was better and I have managed to capture the colour more accurately. The mat was the cut off piece of the free motion quilted panel left over after making the cosy. All I had to do was put the binding on and the job was done. Firstly, many thanks to Maartje, Hilary and Gwyned for linking up last time - a great collection of projects. and other stems actually branching out. There isn't much colour yet, that will come later, but I find this shade of pale brown strangely relaxing. I could never work out why until the day I suddenly realised that this the shade I like my tea, with just the right amount of milk. After paying one euro to climb the church tower, this is the view that awaits you at the top. Finished within a week! My first 12 x 12 quilt, which I have delivered today to Midsomer Quilting for their forthcoming exhibition. When I was at the shop some time ago and heard that the theme for the exhibition was music, I quailed; then it was suggested that I could start with the title of a piece of music and work from there. A couple of weeks ago I did some serious thinking about choosing the music. I knew I wanted to do a free motion landscape, and it would have to be an English landscape for the simple reason that I am totally familiar with the colours and the skies. Therefore it had to be a piece by an English composer, and Vaughan Williams was top of my list. Then I had to decide on which of his works to illustrate, and make sure the landscape was of the right part of the country. In the end, I headed approximately 200 miles North East. First of all I was thinking of the Norfolk Rhapsody. This would mean a flat landscape (totally alien to me, I'm used to hills), which would need plenty of emphasis on the sky. After bouncing around Youtube for ideas, I settled upon In the Fen Country. This video was an absolute Godsend. Not only did it give me the music, but a whole series of landscapes too - all very flat and wet. The starting point was the horizon, with the church nestling in the trees. If you watch the music video you should spot the picture that it is based on. For the water in the foreground I changed the thread every now and again to give the shaded effect. All the threads are Gutermann Sulky Cotton 30 in variegated colours, and I used five or six different shades. For the water in the reed bed I incorporated some green and brown tones. To add interest in the sky there are hand stitched birds. The three birds soaring high up look like buzzards - we often see them here, but I am not sure how common they are in East Anglia. The flying geese just had to figure somewhere, and they fitted nicely into the space beneath the lower cloud. For a day and a half it hung on the wall in the space usually occupied by the Flooded Fields landscape, above the 1949 Singer 15K hand machine that I used for putting on the binding. At the end of the exhibition it will go to a new owner after the auction in aid of Dorothy House. The free motion landscape that I started last week is now well and truly finished. Last night I did the last handstitched details - birds in the sky - and hung it on wall, where it is going to stay for a very short while. 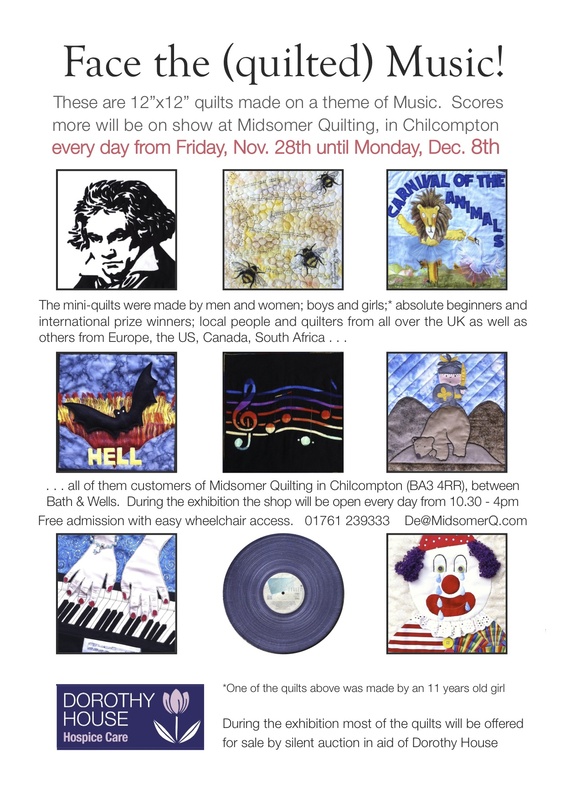 In the next day or so I shall be taking it to Midsomer Quilting so it can be included in their forthcoming 12 x 12 Exhibition. The theme is music, and when I deliver the quilt I am going to see if they can guess which piece of music it represents. So rather than spoil the fun of the quiz, this is all that I am showing for the moment. Update - you can now see the whole quilt here. The scrappy cot quilt that I finished a couple of weeks ago is now bound. I wasn't sure whether the strawberries print I used for the binding was going to look right - the print seemed a little too fussy and I thought it was going to fight with the jolly pink nursery print in the border. It was the only fabric that wasn't going to look hideous, so it had to go on. Once it was on it looked fine. The rusty red in both fabrics pulled the whole thing together. Firstly, many thanks to Carole, Hilary and Gwyned for linking up last time - a great collection of projects. This is just a detail of the free motion landscape that I started last week. The church on the horizon has turned out just as I wanted, although perhaps a tiny bit crooked. In the next couple of days I shall be trimming down the whole piece to 12 x 12 inches, doing the binding and a bit of hand stitched detail to finish it off. It is the hand stitching that is worrying me the most, especially because the landscape is so densely quilted that it now feels like cardboard. Wish me luck! A rogue plant growing near the edge of a crop of wheat. Today I started work on a landscape in the hope that I can make two near-identical pieces by the end of the month. The focal point on the horizon is a church with a steeple. The line of trees looks a bit messy and scribbly. I was glad to get started on the straight lines in the middle distance. It is much quicker work, and changing the thread to a different colour makes it more interesting. So you can see just how quickly you can make progress, here is a little video. I am still testing camera angles - I think this is the best yet. Welcome to Martha, the latest follower - thank you for joining! Last week I hauled the 1934 Singer 128K out of the corner of the sewing room. It is just as well I did, because in doing so I discovered that my star machine, the 1927 Singer 99K was growing a fluffy handle. My intention is to use this machine for the next big quilt I am planning, so I wanted to give it a little run in. Because it has two spool pins I can save time by winding a bobbin while I am sewing. This felt like a great juggling act, doing mitred corners and bobbin winding at the same time. I can't understand why some people need to go bungee jumping for a thrill. This did it for me. Safer, too. This machine is probably one of the most intriguing machines I have. The decals are fascinating. While I was in Spain last month I enjoyed taking photographs of bells. This is the tower of the church at Ainsa. According to Spanish Wikipedia, building started in the late 11th century, finished in the mid 12th century, and it was consecrated in 1181. An additional delight was spotting the house martins' nests in the stonework of the arched gallery above the bells. This is the latest cot quilt that I have made, very similar to the last one, which I made in February. It was the ideal project to get me back into the sewing groove after being away. I have plenty of strips and scraps stashed away in a tin, and I completed the top on Monday and Tuesday. Yesterday I did the free motion quilting on the 15K treadle, and this evening (since taking this photo) I have finished the binding. ... and a fairly big piece of this scrap left over from making Meg's dress. I have to admit that I didn't enjoy doing the free motion quilting that much. I prefer to work on plain colours so I can see where I have been. This print gave me extra problems because the black lines curve in a similar way to the meandering pattern I was stitching. When using a hand machine I always pad the handle with a bit of pipe lagging for comfort, but when I pulled one of my machines out of its hidey hole today and took off the cover, I wondered whether there was enough fur on the handle for me to forget the padding. Oh the joys of living in a damp country. It was quite interesting from a (not quite micro)biological point of view. Once the cover had been off for a short while all the pretty downy fluff fell flat. Moral of the story - check your machines at least once a year to check they aren't quietly festering. If you live in New Mexico and/or a centrally heated house, you might be able to ignore this advice.